For the last 2 years, Google have pro-actively integrated social media (especially twitter) through ‘Google Realtime search’. It shows the strength of social media, especially when comments are re-tweeted and in certain circumstances, shown in the Search Engine Results Pages. Sounds like a good idea for a person searching on a certain topic? If a particular subject is trending at any given time and the social world is interested then Google will tell you about it in their results. This is great! 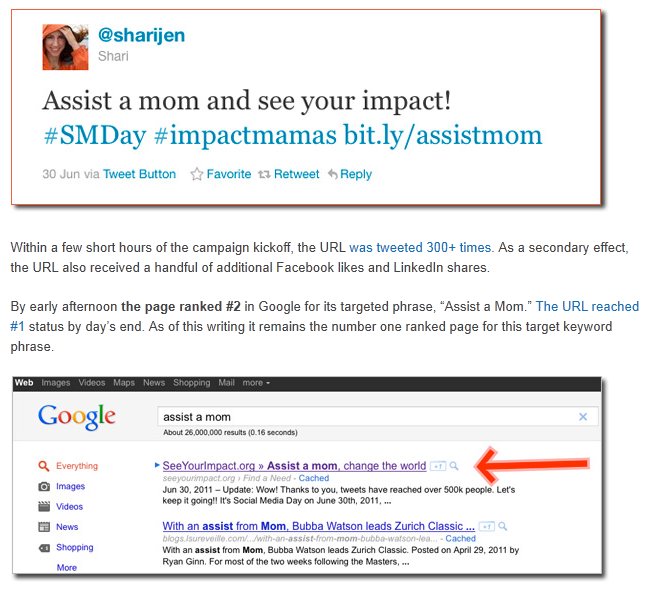 In Cyrus’ article it shows a few examples of social media and its direct influence to the Search Engine Results Pages. The image below from this article demonstrates an example of pre 3rd July. Will this impact my SEO and should I panic? While this certainly demonstrates the importance of social media in any online campaign it doesn’t mean you should go out and set up a million campaigns and get a tonne of Google +1’s to your homepage. Aside from the fact that this is ‘black hat’ you’ll eventually get caught. What it does demonstrate in some instances the importance of a solid social media profile and that it can potentially influence your position in the search engines. If you are serious in your online presence should you ensure you have a solid social platform? Maybe… in reality it could be overkill and you could end up spending a lot of time and money with your BDM or team member performing tasks that won’t actually give you any real measurable results. Truth told, we are certainly recommending to certain clients that they look at their social media presence, especially if their SEO competition does the same and is doing it well. Take a look at your competitors and see what they are doing. Like most Search Engines, in order to rank you don’t have to ‘do it all’; you simply have to do it a little better than your competition. By ensuring you’re keeping an eye on your competition (using social monitors) you’ll understand if now is the time to react, or if you should invest your time in other activities that offer a better return on investment.